Background and Objectives: BK virus-associated nephropathy (BKVAN) has emerged as a leading cause of kidney graft loss, with no known predictors for graft loss and no consensus regarding treatment other than reduction of immunosuppression. Design, setting, participants and measurements: A single-center retrospective analysis was performed of all cases of BKVAN from 1999 to 2005 for clinical predictors of graft loss, with evaluation of the impact of immunosuppression withdrawal (3-drug to 2-drug immunosuppression) within the first month versus reduction of immunosuppression. Results: Of 910 kidney transplants, 35 (3.8%) cases of BKVAN were diagnosed at a median of 15 months after transplant (range, 5.5 to 90 months after transplant), 16 (46%) of which progressed to graft failure at a median of 11 months (range, 2 to 36 months) after diagnosis. Depleting antibody induction was a significant risk factor for graft loss on univariate analysis, whereas early drug withdrawal (<1 mo following diagnosis) protected against graft loss. On multivariate analysis, these findings were independent predictors of graft outcomes. Additionally, when patients were comanaged by referring nephrologists and the transplant center before the diagnosis of BKVAN, the risk of graft loss was 11-fold higher (P = 0.03) than if patients were managed solely by the transplant center. Conclusions: Increased awareness and early diagnosis of BKVAN, with aggressive tapering of immunosuppression once established, is critical to preserve kidney graft function. Early drug withdrawal to low-dose two-drug therapy maintenance may be preferable to a general reduction of agents. BK virus is a polyomavirus that infects the majority of the population and subsequently remains dormant in the kidney without consequence. However, under conditions of immunosuppression, such as renal transplantation, reactivation, and replication, may occur, causing an interstitial nephritis in the renal allograft and can progress to graft failure. First reported in 1995 (1), and in subsequent case series (2,3) BK virus-associated nephropathy (BKVAN) is estimated to occur in 2% to 10% of all kidney transplant recipients (4). Importantly, the diagnosis is often made after the first post-transplant year, a time in which patients may be followed by nephrologists outside the transplant center. Graft survival rates following diagnosis range from 10% to 60% (5), making this diagnosis more devastating than commonly managed complications, such as acute rejection and calcineurin-inhibitor nephrotoxicity. Over the last decade, the recognition of BKVAN as a clinical entity has led to significant changes in the management of the kidney transplant recipient. Currently, much attention is focused upon identification of the patient at risk of developing BKVAN before the onset of clinically apparent renal dysfunction, via urinalysis for “decoy cells” (6) or polymerase chain reaction (PCR) analysis of BKV in urine or blood (7,8) When applied to all patients within the first year after transplant, approximately 30% to 60% will demonstrate BKV viruria and 10% to 20% will show viremia by PCR analysis (9). Using PCR-based screening of blood and urine, with reduction in immunosuppression when BKV is present in blood, Brennan et al. have demonstrated a reduction in the development of BKVAN (9). Despite screening and management algorithms for BKV that have been published, few studies have shown therapeutic benefit in preventing graft loss once the diagnosis is established. Current management options for BKVAN include various immunosuppression reduction strategies, cidofovir, leflunomide, quinolones, and intravenous immunoglobulin (Ig). Although helpful, the published studies are small case series that are often without a comparator arm as supportive evidence (10–17). Given the small number of published interventional studies, the clinician is often faced with uncertainty in determining prognosis of the graft and the appropriate management strategy to implement at the time of diagnosis of BKVAN. Although the biopsy findings at diagnosis are proposed to be a predictive tool for assessing prognosis (18,19), quantitative assessments of viral load at diagnosis have generally not been predictive of outcomes. To date, there has not been an assessment of clinical risk factors for disease progression or a comparison of immunosuppression withdrawal strategies. To address the need to identify factors that may be predictive of graft loss at the time of diagnosis of BKVAN and to assess common strategies suggested to be of benefit in the management of BKVAN, we performed a retrospective analysis of all subjects with the diagnosis of BKVAN at our institution from 1999 to 2005. We tested the hypothesis that a number of characteristics at the time of diagnosis of BKVAN may influence graft survival following diagnosis, such as the renal function at diagnosis, the era of diagnosis, and the use of induction therapy. We also tested the hypothesis that an aggressive strategy of immunosuppression reduction (early withdrawal of 3-drug immunosuppression to 2-drug low-dose imunosuppression) may be more beneficial in preserving graft loss than a general reduction of 3-drug immunosuppression. We performed a systematic review of all patients with biopsy-proven BKVAN at the University of Colorado Hospital who had undergone kidney transplant from 1999 to 2005. This transplant center serves a significant proportion of patients from rural areas that are geographically dispersed over 5 western states. Thus, it is our policy for stable patients who are unable to frequently attend our clinic to be comanaged by referring nephrologists in conjunction with the transplant center at 2 to 3 mo post-transplant. All subjects included in this analysis had undergone renal transplant biopsy for renal dysfunction (sustained change in serum creatinine >0.3 mg/dl without clear etiology), with or without PCR screening of BKV. This study was a retrospective analysis of clinical risk factors hypothesized to contribute to the development and progression of BKVAN (Table 1). These risk factors were selected based on post-transplant characteristics that enhance overall immunosuppression, predict chronic kidney disease, and potentially influence outcomes in BKVAN. For this analysis, two eras of management were defined according to the adoption of PCR-based screening for BKVAN. The first era (1999–2002) was a period in which routine screening for BKVAN was not performed, and the second era (2003–2005) was a period in which PCR screening for BKV viremia and viruria was performed at 1, 6, 12, and 24 mo post-transplant, and in the setting of sustained renal dysfunction without clear etiology (concomitant medications, hemodynamic factors). Patients in the second era with stable renal function who were screened and found to have BKV PCR+ in blood underwent immunosuppression dose reduction without biopsy. Patients with resolution of BK viremia and/or stable renal function were not included in the analysis but are reported separately. Management of immunosuppression in established BKVAN was classified into two categories: those subjects undergoing withdrawal (“Withdrawal”) of one agent (either the antiproliferative agent or the calcineurin inhibitor), or those undergoing reduction (“Reduction”) in dose of two agents without withdrawal during the first 30 d after diagnosis. For both groups, target immunosuppression exposure of the remaining agents was tacrolimus (TAC) 3 to 6 ng/ml, cyclosporine (CSA) 75 to 150 ng/ml, mycophenolate (MMF) 500 mg twice daily, and sirolimus (SRL) 2 mg/daily, goal SRL <8 ng/ml, with further reduction determined by continued viremia and deteriorating renal function. All subjects remained on prednisone 5 to 10 mg/d. Data regarding intravenous Ig, cidofovir, and leflunomide use, given at the discretion of the treating physician, were also collected and evaluated for impact on graft outcomes. When given, leflunomide was started at 20 mg daily with goal plasma trough concentrations of 50 to 100 ng/ml (A77 HPLC assay, University of Colorado Health Sciences Center, Denver, CO), cidofovir was given at 0.25 mg/kg intravenously biweekly × 4 doses, and intravenous Ig (Cytogam) was given at 150 mg/kg intravenously every 2 to 4 wk × 4, then monthly × 4. A comparison of outcomes of these two strategies (Withdrawal versus Reduction), with and without ancillary therapy, was performed. All statistical analyses were performed using SAS, version 9.1 (Cary, NC). Wilcoxon's rank sum test was used to compare time to diagnosis of BKVAN and creatinine values at diagnosis by subgroups. Proportions of patients receiving various treatment modifications were compared between withdrawal and reduction cohorts using a chi-squared test (or Fisher's exact test when expected counts were <5). Univariate and multivariate graft survival was analyzed using Cox proportional hazards regression model, a Wald test was used to compare hazard ratios, and the log rank test was used to compare the Kaplan-Meier curves. For the multivariate analysis, all variables listed in Table 1 were included in the analysis and were not limited to the significant findings on univariate analysis because of the relatively small sample size and the potential for confounding between variables. This study was reviewed and approved by the University of Colorado Institutional Review Board. Of 917 kidney transplants performed during the era 1999 to 2005, 35 (3.8%) were diagnosed with biopsy-proven BKVAN. The median serum creatinine at the time of diagnosis of PVAN was 2.5 mg/dl (range, 1.5 to 6.9 mg/dl). The diagnosis of BKVAN was made at a median time of 15 mo after transplant (range, 5.5 to 90 mo). These findings are consistent with prior reports (20) and suggest that the diagnosis of BKVAN is often made following a significant decline in renal function. The demographic data of these 35 recipients are provided in Table 2. No specific clinical characteristic was protective against the development of disease. The graft survival rate after diagnosis of BKVAN in subjects who had undergone biopsy for renal dysfunction is shown in Figure 1. 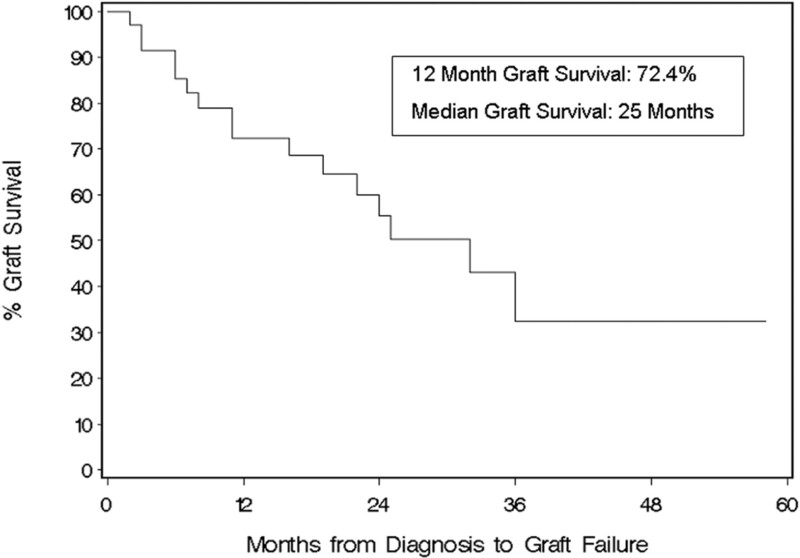 The 1-yr graft survival rate was 72.4% with a median graft survival of 25 mo. Among the 16 of 35 patients who ultimately suffered graft loss, the median time to graft loss was 11 mo (range, 2 to 36 mo). When examining graft survival rates following diagnosis within the two eras studied, no significant differences were noted in graft survival during the active screening era (2003–2005) versus the era in which routine screening was not performed (1999–2002) (P = 0.29). The degree of renal dysfunction at the time of diagnosis was worse in the earlier era, but the difference did not reach statistical significance (mean Cr 2.9 mg/dl versus 2.4 mg/dl, P = 0.27, median Cr 2.7 mg/dl versus 2.2 mg/dl, P = 0.08). Graft failure after diagnosis of BKVAN (n = 35). The 1-year graft survival rate was 72.4%, with a median graft survival of 25 months. A total of 16 of 35 patients ultimately had graft loss with a median time to graft loss of 11 months (range, 2 to 36 months). Table 3 summarizes the clinical characteristics, immunosuppression modifications made between the Withdrawal cohort (n = 17, 49%) and the Reduction cohort (n = 18, 51%), and the frequency and type of ancillary therapy given within each of these cohorts. Calcineurin inhibitor discontinuation accounted for the vast majority (80%) of changes in the Withdrawal cohort, while the changes made in the Reduction cohort were evenly distributed between a ≥50% and a <50% reduction of the antiproliferative agent in addition to calcineurin inhibitor (CNI) reduction within the first month after diagnosis. Transition from one CNI to another (TAC to CSA) comprised a small minority of this cohort. Use of leflunomide, cidofivir, and intravenous Ig was comparable between groups. Figure 2 segregates graft outcomes by Withdrawal versus Reduction cohorts with Kaplan-Meier analysis. When comparing a strategy of immunosuppression withdrawal to immunosuppression reduction, the patients who underwent withdrawal of immunosuppression within one month after diagnosis had significantly better graft survival (one-year graft survival of 87.8% versus 56.2%, P = 0.03) for the entire period. Immunosuppression withdrawal preserves graft function compared with reduction. The Withdrawal cohort had significantly better graft survival at 1 year compared with the Reduction cohort (1-year graft survival 87.8% versus 56.2%, P = 0.03). Univariate analyses of the risk factors hypothesized to affect graft survival are shown in Table 4. Immunosuppression Withdrawal was associated with a 67% decrease in risk in graft loss compared with the Reduction cohort (P = 0.04). The use of depleting antibody induction (used in 43% of subjects who developed BKVAN) was significantly associated with a fourfold increased risk of graft loss (P = 0.01) following diagnosis. A trend toward association of poorer outcomes based on serum creatinine at the time of diagnosis (>2 mg/dl) and change in serum creatinine (a >1.5 mg/dl increase over baseline creatinine one month following transplant) was evident but did not reach statistical significance. The association of elevated creatinine and graft failure diminished when 2.5 mg/dl was used as the comparison point because, as renal function became sufficiently poor, both cohorts (those with Cr >2.5 mg/dl and those with Cr <2.5 mg/dl) fared poorly. This emphasizes the importance of early (before Cr 2.0 mg/dl) diagnosis. When these factors were analyzed as independent predictors of graft loss following diagnosis, similar findings were noted. 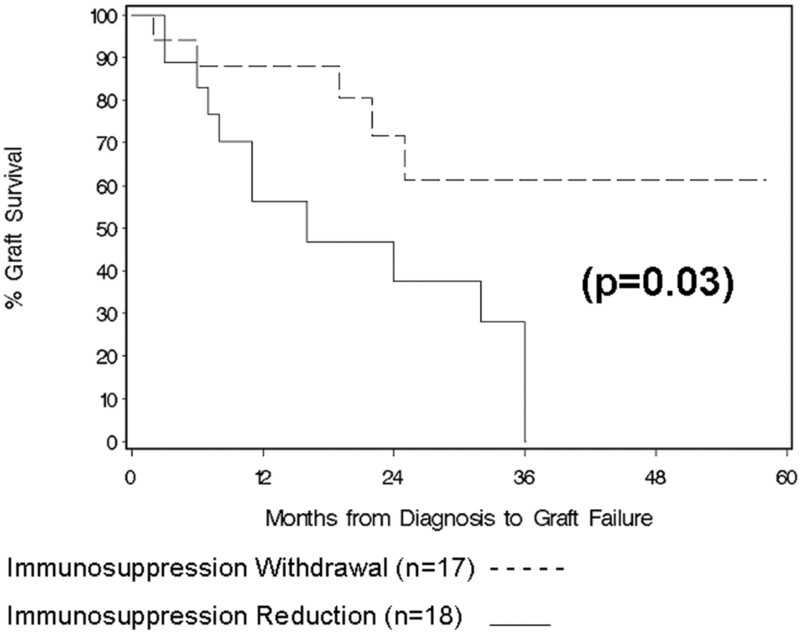 Immunosuppression Withdrawal compared with Reduction resulted in a reduction in risk of graft loss of 72%, and a history of depleting antibody induction use remained a significant predictor of progression to graft loss following diagnosis of BKVAN (Table 5). Additionally, a history of treated acute rejection was associated with a trend toward increased risk of graft loss (P = 0.054). Multivariate analysis identified that transplant management before the time of diagnosis was a significant determinant of outcomes after diagnosis. Patients diagnosed with BKVAN and previously followed by both primary and transplant nephrologists had an increased risk for graft loss 11-fold higher than in those patients solely followed in the transplant center (P = 0.03). Regarding the efficacy of our BKV screening protocol, an additional 30 patients were found to have BKV viremia without renal dysfunction (median viral load 10,995 copies/ml, range 2000 to 653,200 copies/ml) at a median baseline Cr of 1.4 mg/dl. 16 of the 30 had viral loads greater than 10,000 copies/ml at the time of detection. A total of 28 of the 30 subjects underwent immunosuppression reduction, and the remaining 2 subjects underwent CNI withdrawal. One patient death (renal cell carcinoma) and no graft losses occurred in this cohort with a median Cr of 1.45 mg/dl at 12 mo. This study is the first to demonstrate an improvement in outcomes comparing two general strategies of immunosuppression minimization in established BKVAN and is the largest reported series using CNI withdrawal with SRL/prednisone maintenance immunosuppression for BKVAN. Early elimination of one immunosuppressant was significantly more effective in preserving graft function than a strategy of reduction of two agents. This finding was true both when examining unadjusted graft survival and in multivariate analysis, in which this strategy was associated with a 72% reduction in risk of graft loss. Of note, in the Reduction cohort identified in this study, 23% of subjects ultimately underwent immunosuppressant withdrawal (after one month from the time of diagnosis), suggesting that the timing of withdrawal is important and should be considered at the time of diagnosis. The strategy of discontinuation of CNI with maintenance SRL (2 mg/d, goal trough <8 mg/ml) and low-dose prednisone was applied to the majority of patients in the Withdrawal cohort, with considerable success in preventing graft loss while avoiding acute rejection. This strategy was first reported with success in a case series of 3 subjects (21) but with poorer outcomes when recently reported in a separate cohort of 9 patients (5 of the 9 patients lost graft function at a mean follow-up of 17.5 mo following transition to SRL/prednisone, goal SRL trough levels of 10 ± 3 ng/ml) (22). Our more favorable outcomes may be due to a further reduction in immunosuppression with a lower target SRL trough compared with this series. Our report adds to these experiences and supports the use of SRL/prednisone maintenance immunosuppression at the time of BKVAN diagnosis. Previous studies have reported various strategies of immunosuppression reduction following the diagnosis of BKVAN. Ramos et al. described outcomes in 67 subjects with BKVAN in whom CNI exposure was decreased by 50%, with MMF discontinuation in 36, and MMF reduction in 14 patients. Graft failure after 12.6 mo of follow-up was 16.4%, with a subsequent acute rejection rate of 15.3% (6). Vasudev et al. (20) quantified the degree of immunosuppression reduction at diagnosis of BKVAN by a point-scale. Following an approximately 40% reduction in overall immunosuppression and a 70% reduction in CNI exposure, 9 of 25 subjects experienced graft loss in a median follow-up period of 8 mo, with evidence that CNI reduction correlated with a slower rate of decline of GFR (20). Although suboptimal, these outcomes are still generally better than smaller series reported in the literature (3,23). In our study, the Withdrawal cohort fared better than these series, with a 71.6% probability of graft survival at 2 yr, while the Reduction cohort fared worse, with 37.4% graft survival probability at 2 yr, consistent with the hypothesis that outcomes of BKVAN are correlated with the degree of remaining immunosuppression. In studies that combine immunosuppression tapering with investigational agents, it is worth noting that the most impressive reported outcomes with agents such as leflunomide or cidofovir often involve early discontinuation of immunosuppression. In the largest trial using leflunomide therapy in 26 patients with BKVAN (14), leflunomide was initiated concurrent with MMF discontinuation and CNI reduction at the time of diagnosis. In the largest cidofovir intervention trial to date in 21 patients (12), the authors note that MMF may have been more systematically withdrawn in those who received cidofovir. In the largest reported case series to date evaluating intravenous Ig use in 8 patients with BKVAN, an approximately 50% reduction of immunosuppression was reported (17), but no specific details regarding method of reduction were outlined. Finally, Wadei et al. (24) reported no differences in graft survival in 30 subjects undergoing MMF reduction and transition from TAC to CSA-based immunosuppression compared with 25 subjects who underwent MMF reduction and reduction of TAC or SRL, with or without cidofovir and intravenous Ig. Neither intravenous Ig nor cidofovir was independently associated with graft survival (24). Thus, when examining the largest studies to date, it is unclear if the investigational therapy dictated outcomes or if the outcomes were primarily the result of withdrawal strategies of immunosuppression. Just as these prior studies are limited by the overlap of interventions, our study cannot definitively rule out whether ancillary therapies influenced outcomes. However, given the similar proportions that these agents were prescribed between the Withdrawal and Reduction arms, the lack of significance of ancillary therapy use on outcomes in univariate and multivariate analysis, and similar graft loss rates when comparing individual interventions (33%, 39%, and 29% graft loss in those receiving leflunomide, intravenous Ig, or cidofovir, respectively), it is unlikely that any of these therapies were critical in differentiating those with graft survival versus failure. Aside from defining the impact of immunosuppression on outcomes in BKVAN, this study also suggests for the first time that prior depleting antibody induction therapy may predispose to worse outcomes following diagnosis of BKVAN. Additionally, in multivariate analysis, prior treatment for acute rejection showed a trend toward increased risk of graft loss following diagnosis of BKVAN. Since the majority of patients (7 of 9) that were treated for acute rejection received depleting antibody therapy, these data further implicate a history of depleting antibody use in BKVAN outcomes. Whether depleting antibody therapy predisposes patients to BKVAN is controversial, as some studies have found a correlation between antilymphocyte preparation use and the development of BKVAN (22,25) and others have not (9,26). It is possible that patients who are given depleting antibody therapy, either for induction or acute rejection, are at higher immunological risk and thus may be exposed to higher levels of chronic immunosuppression, which could bias the outcomes in BKVAN. Nevertheless, given our findings both in univariate and multivariate analyses, the prior use of depleting agents may be associated with poorer outcomes and thus it may be prudent to consider a more aggressive immunomodulatory strategy in those with a history of depleting antibody exposure and active BKVAN. No conclusions can be drawn regarding the impact of steroid use either chronically (since all patients were on steroids at diagnosis and remained on prednisone) or acutely in the setting of acute rejection (given the small number of patients treated with steroids alone) in the progression of BKVAN. Finally, this study is the first to examine the differences in outcomes of BKVAN diagnosed in different clinical settings. On multivariate analysis, the likelihood of graft loss due to BKVAN was 11-fold higher in patients who had been managed collaboratively by both the transplant center and the referring nephrologists compared with those patients only followed by the transplant center. Potential hypotheses for this difference include longer delays in diagnosis, less rigorous screening for BKV before the onset of clinically apparent disease, inherent challenges in following patients in rural areas during a post-transplant period of expected stability, and a diffusion of clinical decision-making in a disease process that is rapidly progressive. While a number of these hypotheses cannot be tested, we did not identify a difference in time to diagnosis post-transplant (median 15.5 versus 15.0 mo, P = 0.77) and only noted a trend in higher serum creatinine at the time of diagnosis, (median Cr 2.5 versus 2.2 mg/dl, P = 0.201) in those patients followed collaboratively. These findings warrant closer consideration in the nephrology and transplant community because patients by financial and physical necessity may require local nephrology care. To ensure optimal outcomes, transplant center guidelines for screening and management strategies of BKV must be communicated and reinforced. A limitation of our study is that the majority of patients were on an immunosuppression regimen (CNI/SRL) at the time of diagnosis that is relatively uncommon in clinical practice (27). As a result, the strategy of CNI elimination, which comprised the vast majority of the Withdrawal cohort, may not produce similar outcomes in patients on more standard CNI/MMF-based immunosuppression (28,29). There are other limitations of this study. First, given the evolution of BKVAN screening and histologic classification over time, not every patient had quantitative PCR monitoring, biopsy scoring, or prior screening for BKVAN; thus, these characteristics were not included in this analysis despite their proven value (8,9,19). We attempted to account for these deficiencies by examining BKVAN outcomes segregated into separate eras and found that there was no difference in outcomes between eras on univariate or multivariate analysis. By comparing outcomes by era, the potential for selection bias increases since the clinical presentation of BKVAN may potentially be different due to adopted screening strategies. Additionally, immunosuppression changes made following the first month of diagnosis were incompletely reported; thus, no firm conclusions regarding attainment of minimal immunosuppression goals after the first month can be made. Finally, given its retrospective nature, one cannot exclude the possibility of bias when selecting patients for withdrawal rather than reduction of immunosuppression, as those patients who underwent withdrawal may have had characteristics that were not identified within this study that imparted less risk to rapid withdrawal. A similar argument regarding the use of ancillary therapies can also be applied. Despite these limitations, this study offers many novel findings. While there still is no specific means to taper immunosuppression in BKVAN, our findings suggest that drug elimination, particularly CNI elimination with SRL/prednisone maintenance, is an effective means of achieving improved outcomes. Depleting antibody therapy may be a risk factor for progression of disease and may identify patients in whom more aggressive immunosuppression reduction is needed. Finally, the objective data suggesting different outcomes from different practice settings highlight the need for enhanced collaboration. Ultimately, these outcomes noted in BKVAN are still suboptimal, and early identification of disease must remain a major focus of postrenal transplant management. An abstract describing portions of this work was submitted to the American Society of Nephrology 2007 Annual Renal Week meeting and was presented in a poster session at the meeting in San Francisco on November 3, 2007.